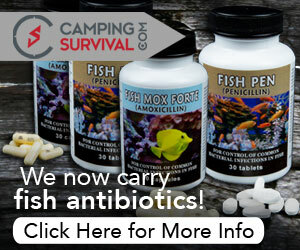 For those of you who want to up your defensive handgun skills or are interested in improving your scores in IPSC (International Practical Shooting Confederation) or IDPA (International Defensive Pistol Association) competitions but don’t have the money for ammunition and range fees there are other options. 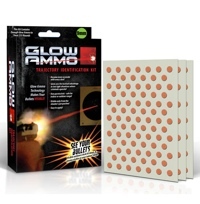 The founders of BAM Airsoft who are both competitive ranked shooters in IPSC (pronounced “ip sic”) have developed a whole set of IPSC and IDPA style targets which have been designed specifically for practical shooting training with airsoft pistols and can be set up in the convenience of your home. 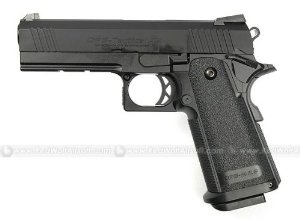 According to BAM, with a quality blow-back style airsoft pistol, airsoft training can effectively supplement actual real-gun training with some amazing results! I know what you’re thinking. 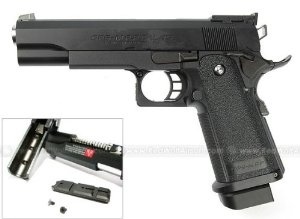 How can you train for IPSC, IDPA, or defensive handgun when airsoft pistols are only reliably accurate out to 7 yards (and that’s pushing it some cases) and the mininum target distance in IPSC and many scenario-based practical shooting training is greater than that? Well, the key has to do with perspective and sight picture. For example a scaled-down version of a larger target will look the same in the gun’s sight picture if the larger target is placed at a specific distance further away than the smaller scaled-down version. 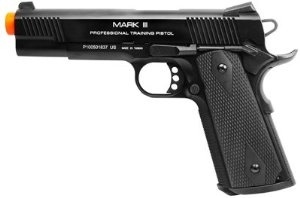 The obvious major difference between airsoft and real pistol shooting is the lack of strong recoil (so sight tracking would be different). 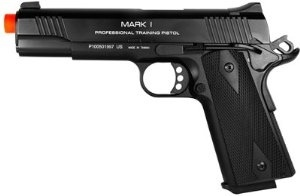 Despite this, it is still an excellent form of training that saves money, is convenient since various practical shooting courses can be set up in the comfort of your home/garage, and it’s just plane fun. And did I mention? It beats being relegated to only dull dry-firing practice. 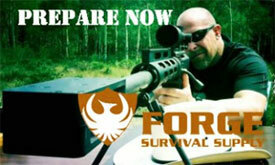 Tokyo Marui is, according to BAM, the “best out of the box airsofts” available. Very accurate and with a boat load of aftermarkets available, the sky’s the limit as for however you want to trick them out. Just wanted to quickly let you know that I created a new menu item called “Food Storage Calculators” that puts the two calculators I had created together in one convenient spot. I’ve already received a number of good recommendation on improving them and will be implementing these changes soon. Like I mentioned before, these calculators are a work-in-progress so if you have any ideas or suggestions on how to make them better please leave a comment or send me a mail via the Contact link. 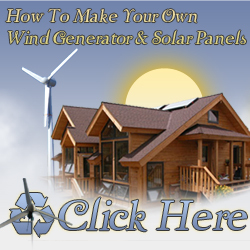 EpiCenter.com: These guys go into some good detail on how to convert a lawn mower into a generator, detailing setup, build, and wiring. What's great is that they sell all the parts you need so you don't have to go digging through the web to find the different parts. Whether it's due to a natural or man-made disaster, an extended grid-down situation is a very real scenario and one that I am always trying to prepare for. For this reason, I like to buy tools and gear that can still function without the need of electricity. 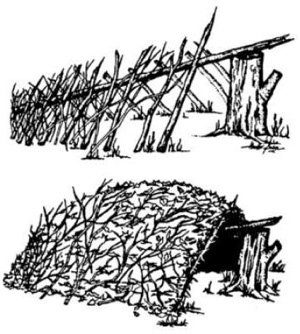 Since I have quite a bit of wheat grain stored away, and given the fact that I don't want to use the two-stone technique that my hunter/gatherer ancestors had used, I knew I would be needing a way of turning all that wheat into flour without an electric appliance. Which brings us to today's post. I thought I'd take a moment to share with you guys my review of two popular hand-powered wheat grinders that I purchased: the Back to Basics (also known as the Victorio) Grain Mill and the Wondermill Junior Grain Mill. 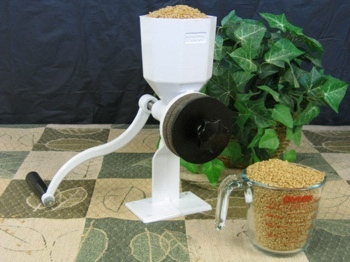 The quality of the Back to Basics grain mill is very good. The plastic hopper fits snugly into the metal housing, and the auger, handle, milling cone and shaft make for a solid working unit. Overall it is sturdy and well put together. Also, given it's small size, it can easily fit into a kitchen drawer or be stored away without much trouble. 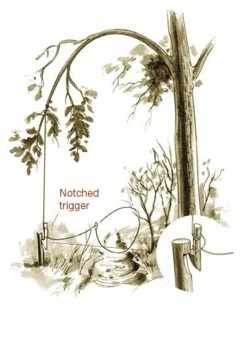 Setting up the mill is a simple process. 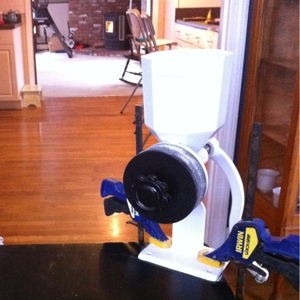 It easily mounts to a counter top or table with the included clamp screw and I had no issues with it shifting or moving around as I turned the handle to grind up my wheat. Although the quality is good and it has had no problems doing its job, after using it for some time the main beef I have with it is how long it takes to grind wheat. It's small size -- while good for storage -- leads to slow (and low) milling output. For example, to grind a cup of wheat (which makes about 1 1/4 cups of flour) takes around 5 minutes (it took me 4:51 without rest and at a good pace)! This is fine for an occasional loaf or two, but when you start making bread regularly it quickly becomes a hassle. Remember, an average loaf of bread is around 4-5 cups of flour. Multiply that by 5 minutes and you have more than 20 minutes of wheat grinding (probably longer since at some point you'll need to take a break) -- by hand, per loaf! 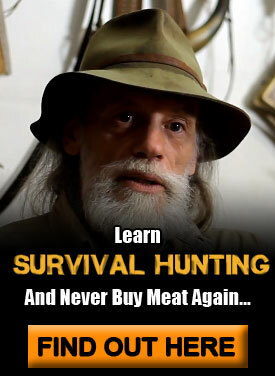 Not something you want if your going to be living off of your long-term food storage. Since the Back to Basics Grain Mill was the first hand-powered grain mill that I purchased (around 2 years ago), the first thing that attracted me to it was the price; At around $60 it was cheaper than most other hand-powered grain mills out there and the reviews seemed fairly positive so I took a chance and bought it. If the Back to Basics mill is built strong then the Wondermill Jr. is built like a tank. The housing, hopper and body is a solid metal uni-body construction that has a thick powder coat finish that resists scratching and chipping. The Wondermill Jr. also has a large hopper that holds slightly more than a quart. While that's great and all, from my perspective hopper size is not that important in a hand-powered mill since you're right there operating the thing and refilling as you're going along is not an issue. This would be more important in an electric version where you'd leave it to let it do its thing. 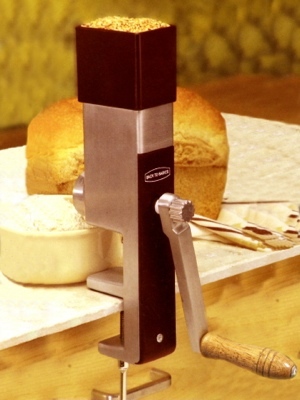 The handle is around 10" long giving you the leverage to easily and quickly grind most grains without too much exertion. It also comes with two stone heads for grinding hard dry seeds. If you purchase the Deluxe version it also comes with stainless-steel burr grinders which allow you to grind up oily nuts and seeds to make things like nut butter. Pretty cool I guess but not that practical for my purposes. For the setup side of things, the Wondermill Jr. is more of a hassle than the Back to Basics mill. Since I didn't buy the Wondermill Jr. Deluxe that comes with an adjustable mounting clamp (which would make it just as easy to set up as the Back to Basics mill) I will have to mount the base to a table with wood screws, making it a permanent fixture. As a temporary solution, you can see in my picture that I jury rigged it by using vice clamps. 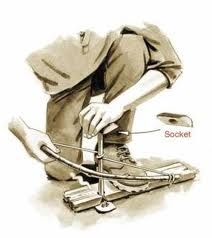 If you want more mobility, another option would be to mount it to a board which you could vice clamp to a number of platforms. The Wondermill Jr. is a pleasure to use. It's long handle and large stones make wheat grinding a cinch and it's fast! Just to compare, I was able to make around 1 1/4 cup of flour in about a minute -- 5 times faster than the Back to Basics mill. The cost of the Wondermill Jr. is around $165 dollars. The Deluxe version, which includes the adjustable clamp and stainless-steel heads, will cost you around $220. And by the way, you can always purchase the additional heads as well as the clamp at a future time if desired. On "Fine" setting, ground flour is still coarse. Flour spews out the sides of the grinding stones requiring a fairly large receptacle (note: the latest models come with a flour guide that fixes this issue that can also be purchased for about $10 if your model is older). Cost is more expensive than the Back to Basics mill but worth it given the efficiency and quality. Overall the Back to Basics mill will do the job, and if you're only interested in a back up and price is an issue, then it's a pretty good mill. On the other hand, the Wondermill Jr. is leaps and bounds over the Back to Basics mill. But realize that the cost is substantially more (about $100+ more), so you're paying for the upgrade. However, if I could go back in time, I would have not purchased the Back to Basics mill, although it's nice to have the extra mill for redundancy or future trading reasons. For me, one of the biggest reasons -- besides the speed of output -- is the quality and "fineness" of the flour. The Back to Basics mill makes a pretty coarse flour (even on its finest setting) whereas the Wonder Mill Jr. makes a very fine flour. The finer the flour, the better the bread (in my opinion) and you have the option of making things that require fine flour like pastries and pie crusts. 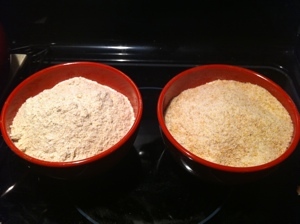 Here's a photo showing the difference in consistency of the flour between the Wondermill Jr. (left) and the Back to Basics (right).